Welcome to electrician-courses.info our site is all about how to go about training to be an electrician in the UK! On this website we aim to bring you the most up to date, concise and helpful information if you are interested in becoming an electrician. We’ll help to explain what qualifications you’ll need to get in order to be able to work as a qualified electrician. And which courses will get you trained up in order to successfully gain those qualifications. We’ll also help you find out where your nearest City & Guilds accredited electrical training centresare with our UK courses map. So all in all we hope you’ll find this site useful to you in planning out your new career. First off, is becoming an electrician the right career choice for you? Well, let’s face it. Not everybody wants to become some sort of desk jockey stuck in an office all day doing whatever it is they do, but with the decline of the heavy industry and manufacturing jobs in this country a job in the trades is one of the few “proper jobs” that are left. However, that being said becoming an electrician is not for everyone. It can be physically tough and you’ll be expected to work in cramped and dirty spaces. But, if you like the idea of being out and about, going from site to site getting stuck into the day’s work then being an electrician is a cracking choice! Because of the inherent safety issues involved with electrical installations it is tightly regulated by the government and has a strict set of qualifications that you must achieve in order to work as an electrician. As a result of this, it is somewhat more complicated to become a qualified electrician than say some of the other construction trades. Due to this, qualified electricians are in high demand and short supply which also means electricians are among the most well paid of the construction trades. READING ARCHITECTS OR CONTRACTORS PLANS TO WORK OUT WHERE TO FIT WIRING, SOCKETS AND POINTS. CARRYING OUT INITIAL INSTALLATION, KNOWN AS THE ‘FIRST FIX’ – FITTING WIRING ALONG WALL CAVITIES AND THROUGH CEILINGS AND FLOORS. FITTING FUSE BOXES, CIRCUIT-BREAKERS AND EARTH TERMINALS. MOUNTING BLACK BOXES ON WALLS TO TAKE PLUG SOCKETS, SWITCHES, LIGHT FITTINGS AND APPLIANCES. When you’re ready to start work you have many options available to you. You could start up on your own as a self-employed electrician or maybe you’d like to have the security of working for an already established firm. Whichever path you choose once you’ve gained this valuable skill set, you’ll take it with you for life – you can’t be laid off being an electrician once your trained and qualified you are one, and no one can take that from you. Enough already! What are these courses that you speak of? Well, traditionally the route you would of normally taken to become an electrician was to complete an 2 – 3 year apprenticeship, and in many cases this could still the preferred method of getting trained up. Especially if you’re just out of school or are under 25 years of age. However, if you are over 25 or just want to get trained up faster, then the availability of purpose built trade skills training centres in the UK have transformed the process of getting trained as an electrician (and many other trades). There’s never been more convenient time to start on a course and become a qualified electrician! The training centres have allowed more and more people to take up training course who otherwise would be unable to, with the traditional methods. Because, most college based courses will only supply you with 2 days a week of training spread out over 2-3 years, whereas a full time course at a training centre will enable you to train 5 days a week Monday – Friday 9am – 5pm over the course of a few weeks or months. Depending on what course you choose. You’ll be learning everything that an apprentice on a 2 year apprenticeship would learn only condensed into your full time course. So you can see you’ll be spending a similar amount of time learning your new skills as an apprentice would, but on a faster time scale. The courses are usually split into two parts; theory training on electrical installation in a classroom environment, and the practical hands on training which takes place in mock up work places. So you can quickly put into practice the skills you are shown in the classroom. The time needed to complete an electrician course will vary depending on the courses you choose and your training provider, but on average the courses usually range from 6 to 8 weeks. Yes it’s true; you can become a qualified electrician in just 8 weeks (with a lot of hard work)! Entry to an intensive electrician training course is open to almost anyone as there are no formal entry qualifications, however you must have good colour vision to become an electrician, you can get checked by an optician if you’re unsure. It’s also important to check that the training centre you pick is a reputable training establishment and not some cowboy outfit. Lucky there is a simple way you can do this. Check whether they are City and Guilds accredited (or another professional training body), that way you’ll know they are up to the expected industry required standards, and can give you industry recognised qualifications. Depends; Domestic Installer vs Electrician! Once you decided you want to train as an electrician with a dedicated training centre, it’s important to know what are the qualifications that you are going to need at the end of it. 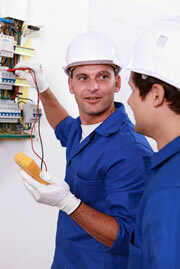 Here you must decide on whether you want to be a Domestic Installer or an Electrician. Let me explain, if you would like to work as an electrician that you may of had come round to your house to do electrical work and that is all, then you should choose the Domestic Installer route. However, if you would like to do this plus be able to work in a commercial environment, like offices, factories, super markets etc. then you need to be trained as an electrician. The qualifications you’ll need for each are different. You must have the Electro technical Services NVQ at level 3, which is awarded by the City & Guilds or EMTA Awards Limited. The City & Guilds 2330 levels 2 and 3 contain the underpinning knowledge for the NVQ level 3. However, an NVQ level 3 can only be obtained through on-the-job assessments by a certified city and guilds examiner carried out in a place of work place (or simulated work environment) by you. Wether you choose domestic installer or full electrician, the training providers normally wrap up these different qualifications into an overalltraining package depending on which option you choose. Some course providers may be able to get you a work placement in order for you to complete your NVQ – ask if they offer this as part of the training package! Some courses may cost several thousand pounds yet the qualification you gain at the end may not stand up when it comes to getting a job. It is essential to find out if your courses are accredited. We recommend that (where possible) you visit the training centre first, so you can check out what’s what and if the staff and facilities are what you should expect. I hope this article, has helped explain and clear up for you the process of getting trained as a qualified electrician in the UK. We promise that on our site we will only list reputable training centres that are accredited by leading industry awarding bodies.